The final year Objective Structured Clinical Examinations (OSCEs) test a broad range of practical skills, knowledge, examination technique and communication abilities, and can be a daunting prospect. The Easy Guide to OSCEs for Final Year Medical Students covers, in a self-assessment format, over 99 sample OSCE stations including the standard history, examination and general skills stations. This edition includes additional commonly examined cases and instruction on how to interpret a paper. With newly created colour illustrations and clinical photographs, the clear layout and easy-to-read style prepares students for the examination environment and focuses on the specific areas and responses examiners look for. The step-by-step guide provided for each OSCE station includes techniques on how to pass, what to say, what to ask for and what to do. 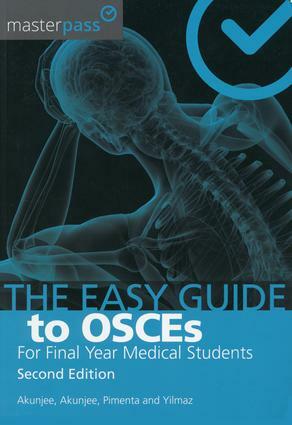 It is an invaluable guide to all those preparing for the OSCEs. "Refreshing and highly relevant. All clinical knowledge has been thoroughly researched and is in line with current evidence and guidelines. This is an excellent book that will reward all those who study and apply it in the all-important finals!" Muhammed Akunjee, MBBS, MRCGP (distinc. ), PgCert (Diabetes), PgCert (MedEd), is currently a GP Principal and GP Appraiser in North London. He is a CCG Board Member for Haringey and has examined OSCEs at Imperial College medical school. Nazmul Akunjee, MBBS, MRCGP, is a GP partner at West Green Surgery and IT Lead for NHS Haringey CCG. He too is a GP appraiser and has examined for UCL medical school OSCEs. Dominic Pimenta, MBBS, is a Core Medical Trainee at UCL Hospital. He is currently running local and national medical student teaching alongside clinical research in infectious disease and cardiology. Dilsan Yilmaz, MBBS, MRCS, is an Academic Clinical Fellow in General Surgery based at The Royal London. She is involved in national medical student teaching programmes and is studying for a master’s degree in medical education at the RCP.